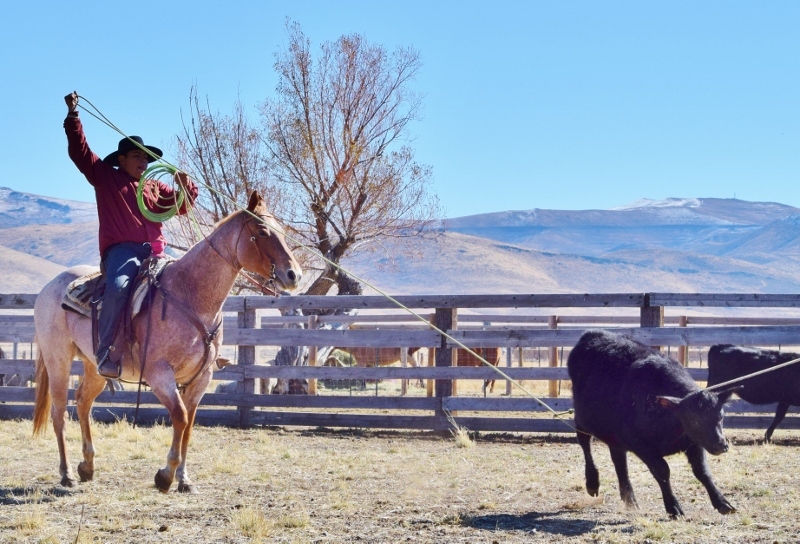 Roping is an important skill for any working cowboy to have, and it’s also a great way for equestrians of other disciplines to cross-train. Here are some tips for selecting and training a rope horse from trainer Casey Awbrey. A lifelong cowboy, Awbrey worked for reputable rope horse trainer Bill Hill in Merrill, Oregon for several years. After leaving Hill’s employ, Awbrey successfully ran his own training business. He now works as an exterminator and trains rope horses as time allows. Based in Klamath Falls, Oregon, he competes in ACTRA and jackpot team ropings. JY: What is the best candidate for a team roping horse? CA: It’s a lot easier to train a horse that’s catty like a cow horse. They usually come along faster than one that isn’t cowy, they’re going to be easier to rope on. There’s so many bloodlines with horses that are cowy, it’s hard to specify just one. Ranch horses, it doesn’t take much for them to make rope horses, either, because horses that have been roped on and doctored quite a bit, it’s pretty easy to make a rope horse on ’em. Since these ranch horses have been roped on, they could easily transition to team roping as well. JY: How do you determine if a horse should be a head horse or a heel horse? CA: All horses are going to be better at one end or the other, but it just depends on their size and their stride and everything. It seems horses that are shorter strided, they make better heel horses, and horses that are longer strided, you can head on them. It’s really hard to heel on a longer-strided horse. All my horses, I like to get to where I can do either end on them. Most team roping horses specialize in either heading or heeling. 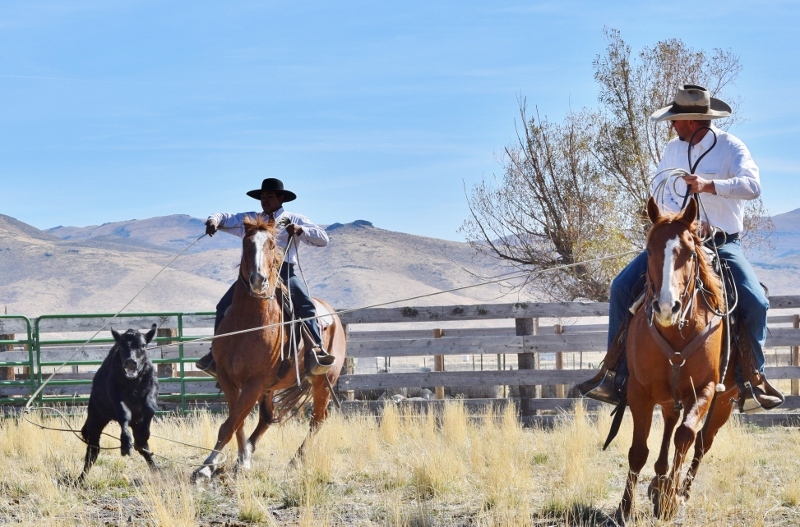 Most ranch horses are adept at both, but better at one. JY: What’s your advice for maintaining a finished rope horse? CA: Don’t make too many runs on them, score them a lot to keep them good in the box, just make four or five good runs on them and call it a practice. Just try to keep them solid, don’t really practice. Keep them in shape just by riding them outside, lope circles. JY: What’s the biggest key to being a good roper? JY: Can ranch work benefit a team roping horse? CA: I like to brand on ’em a bunch before I start to team rope on ’em. There’s lots of stuff happening at a branding, going every which way. It seems when you start roping on them and something gets fouled up, it’s not such a bad deal. JY: What’s your advice for novice team ropers? CA: Lots of practice and hang out with people with higher numbers so they can help you. JY: Do you change your methods and style from arena roping to outside ranch roping? CA: I don’t really try to change my roping, I just do the same thing. When I’m out doctoring, I keep track of how many times I miss. I’m always trying to improve. 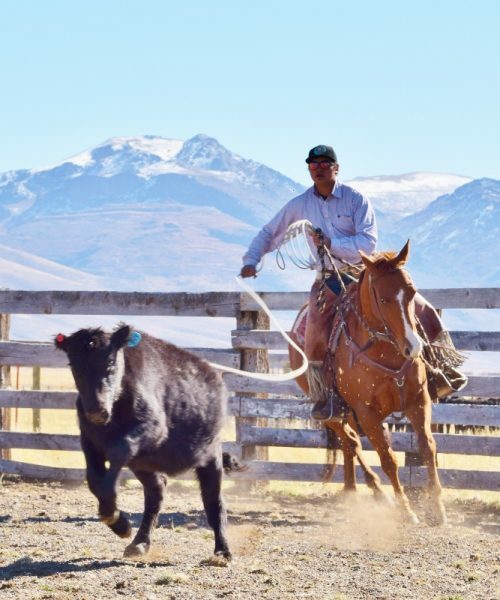 Whether roping in the ranch or the arena, catching and improving should always be two primary objectives.